Bring water and butter to a rolling boil, stir in flour. Remove mixture from heat and put in mixer; let set for about 7 minutes. Add eggs one at a time, beating well after each addition. Drop by mounded tablespoonfuls onto ungreased baking sheet. Bake at 400 degrees for approximately 30 minutes or until nicely browned. Whisk together cornstarch and sugar in heavy saucepan. Gradually add 2 c. milk. Cook, whisking constantly on medium heat. In separate bowl, mix 3 egg yolks with 1 cup milk; slowly stir into milk and sugar. Cook stirring constantly until thickened. Remove from heat. Add butter and vanilla and stir until melted. 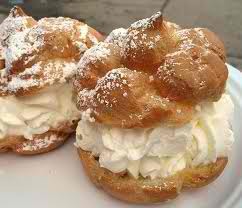 Cool completely and fill cooled and split cream puffs. *Note: Jenny worked at a local diner for a summer and learned to make hundreds of these delicious Cream Puffs…what a delicious treasure!